Fig. 4. Potential interlinked system of recycling nutrients. The diagram shows a potential route of nutrient transport of the planet in the past. Red arrows show the estimated fluxes or diffusion capacity of nutrients listed in Table 1. Grey animals represent extinct or reduced population densities of animals. Animals play an important role in the transport of nutrients, but this role has diminished because many of the largest animals have gone extinct or experienced massive population declines. Here, we quantify the movement of nutrients by animals in the land, sea, rivers, and air both now and prior to their widespread reductions. The capacity to move nutrients away from hotspots decreased to 6% of past values across land and ocean. The vertical movement of phosphorus (P) by marine mammals was reduced by 77% and movement of P from sea to land by seabirds and anadromous fish was reduced by 96%, effectively disrupting an efficient nutrient distribution pump that once existed from the deep sea to the continental interiors. The past was a world of giants, with abundant whales in the sea and large animals roaming the land. However, that world came to an end following massive late-Quaternary megafauna extinctions on land and widespread population reductions in great whale populations over the past few centuries. These losses are likely to have had important consequences for broad-scale nutrient cycling, because recent literature suggests that large animals disproportionately drive nutrient movement. We estimate that the capacity of animals to move nutrients away from concentration patches has decreased to about 8% of the preextinction value on land and about 5% of historic values in oceans. 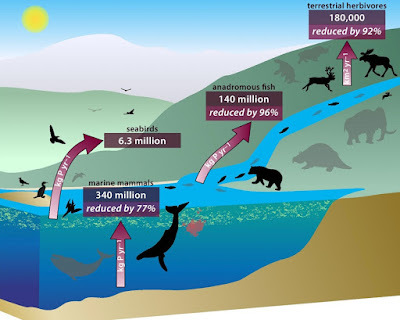 For phosphorus (P), a key nutrient, upward movement in the ocean by marine mammals is about 23% of its former capacity (previously about 340 million kg of P per year). Movements by seabirds and anadromous fish provide important transfer of nutrients from the sea to land, totalling ∼150 million kg of P per year globally in the past, a transfer that has declined to less than 4% of this value as a result of the decimation of seabird colonies and anadromous fish populations. We propose that in the past, marine mammals, seabirds, anadromous fish, and terrestrial animals likely formed an interlinked system recycling nutrients from the ocean depths to the continental interiors, with marine mammals moving nutrients from the deep sea to surface waters, seabirds and anadromous fish moving nutrients from the ocean to land, and large animals moving nutrients away from hotspots into the continental interior. "Earth has a problem: not enough poop." The extinction of megafauna both at land and at sea has led to a shortage of mega manure, new research finds. As a result, the planet's composting and nutrient-recycling system is broken.